After two days of unsuccessful fishing (see here), the first shark was finally caught early this morning, Thursday September 29, off Boucan Canot. The boat ‘Magnum’ returned to the port with the catch, a 2.44 metres long bull shark (Carcharhinus leucas), at about 11 am. 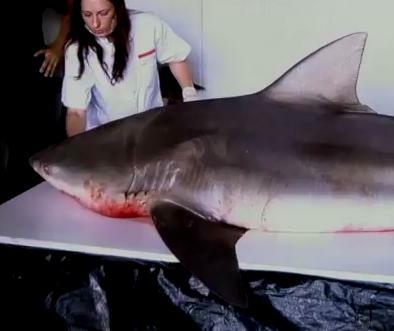 The 156 kg shark was taken to a ‘cold room’ where experts conducted an examination of the animal. At noon, the ‘Magnum’ has left the harbour to join the other vessel ‘Are Nui’ again. According to ‘La 1ere’, the latest fishing operation has been carried out where Eddy Aubert was fatally attacked on June 15. One of the fishermen, participating in this shark hunt, was recently fined in court after the controversial killing of a bull shark last February (see here). Today is the third and last day of the authorised shark hunt in Reunion Island (more info). Note: Please see the related video in our Video Section (here).